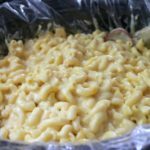 This crock pot mac and cheese recipe made with velveeta is a creamy and deliciously easy mac and cheese recipe the whole family will love. After cooking macaroni, drain and add to slow cooker. Add Olive Oil and Butter and toss to evenly coat the cooked macaroni. Cook on low for 2 hours in the slow cooker. Stir after one hour. My slow cooker which I’ve owned for 6 months took only 2 hours to make this macaroni and cheese. If you have an older slow cooker, it may take longer. If the macaroni and cheese is complete before your guests arrive, you can leave the slow cooker on warm. Use a slow cooker bag for easier clean up.